Examples and solved problems - differentiation of common algebraic, exponential, logarithmic, trigonometric and polynomial functions and terms; testing for differentiability . 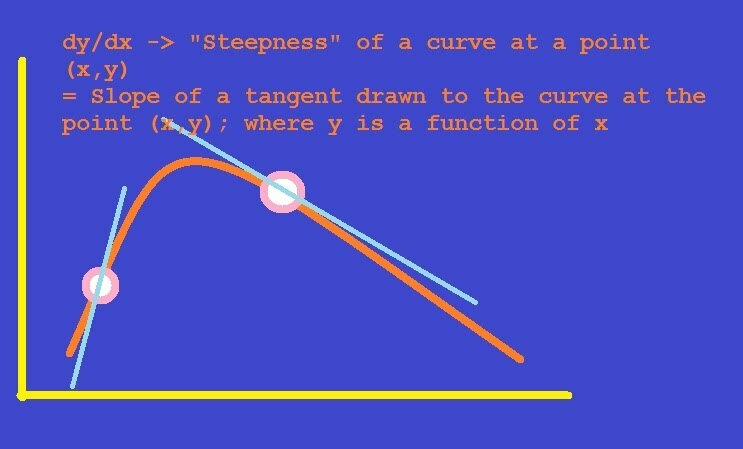 Here's a quick look at the kind of problems we will solve in this tutorial. We will also try to sketch and look at functions visually to some extent. f (x) = x sin (1/x) when x != 0 and f(x) = 0 when x = 0. Show that f (x) is continuous for x = 0 but has no derivative for x = 0. Companion MCQ Quiz for Single Variable Calculus- Differentiation Set 1: test how much you know about the topic. Your score will be e-mailed to you at the address you provide. Quick and introductory definitions related to Funtions, Limits and Continuity - Defining the domain and range of a function, the meaning of continuity, limits, left and right hand limits, properties of limits and the "lim" operator; some common limits; defining the L'Hospital rule, intermediate and extreme value theorems. Functions, Limits and Continuity - Solved Problem Set I - The Domain, Range, Plots and Graphs of Functions; L'Hospital's Rule- - Solved problems demonstrating how to compute the domain and range of functions, drawing the graphs of functions, the mod function, deciding if a function is invertible or not; calculating limits for some elementary examples, solving 0/0 forms, applying L'Hospital rule. Functions, Limits and Continuity - Solved Problem Set II - Conditions for Continuity, More Limits, Approximations for ln (1+x) and sin x for infinitesimal values of x - More advanced cases of evaluating limits, conditions for continuity of functions, common approximations used while evaluating limits for ln ( 1 + x ), sin (x); continuity related problems for more advanced functions than the ones in the first group of problems (in the last tutorial). Functions, Limits and Continuity - Solved Problem Set III - Continuity and Intermediate Value Theorems - Problems related to Continuity, intermediate value theorem. Introducing Integral Calculus - Definite and Indefinite Integrals - using Substitution , Integration By Parts, ILATE rule - Theory and definitions. What integration means, the integral and the integrand. Indefinite integrals, integrals of common functions. Definite integration and properties of definite integrals; Integration by substitution, integration by parts, the LIATE rule, Integral as the limit of a sum. Important forms encountered in integration. Integral Calculus - Solved Problems Set I - Basic examples of polynomials and trigonometric functions, area under curves - Examples and solved problems - elementary examples of integration involving trigonometric functions, polynomials; integration by parts; area under curves.